From the episodes I've seen, and the reviews I've read elsewhere of the episodes I haven't from people like Myles McNutt, I get the sense that "Glee" is a show with a serious identity crisis. At times it's as broad and in-your-face and self-congratulatory as every other Ryan Murphy show that I eventually stop watching out of frustration, and at other times it can be relatively human-scale - and, to my mind, much more interesting. "Wheels" - written, ironically, by Murphy himself - was one of the latter group of episodes. No stupid fake pregnancy subplot (though it did have the slightly less stupid fake baby daddy subplot), nor any of Jessalyn Gilsig, period. Sue Sylvester still said outrageous things, but didn't seem like a cartoon (and that was even before the payoff to the Down syndrome story, which Jane Lynch nailed). Rachel still took a lunch tray to the face, but overall the number of opportunities to laugh at the characters' misfortunes was way down from some earlier episodes. In keeping with that last part, the episode did a nice job of putting the viewers inside the heads of Artie, and Kurt, and even Kurt's dad(*). It took their problems seriously, and wrapped two very good musical performances (particularly the re-arranged "Dancing with Myself") around them. (*) I would say, "Who knew Mike O'Malley could be a good dramatic actor?" if there wasn't so much abundant evidence that it's much easier for comedians to play serious than for serious actors to play funny. You can discuss amongst yourselves how funny you find O'Malley. Murphy recently told the LA Times that "Wheels" typifies where he wants to see the show going forward, tonally. I hope he can stick to that. I'm still not 100 percent in the show's target audience - the showtunes don't inherently make me happy the way they do some of my friends - but at least with this episode, I could see the outlines of the show that the "Glee" fans are so obsessed with. Not sure when/if I'll be writing about it again, but what did everybody else think of this one? I've been a fan all along but I think this episode worked better than a lot of others. For a whole bunch of reasons but for me (and I'm sure this is going to be unpopular) a lot had to do with the downplaying of Rachel. She's fine in smaller doses (or when she gets to act like a human) but they use her too much. I also enjoyed at least the idea that people in Glee Club might be really upset that she gets every single solo. Also they used most of the cast, which they've been neglecting for most of the season. There were enough funny moments but not so absurd that it didn't manage to hold together as a drama. If the show is going to be like this every week it won't just be a guilty pleasure. LOVED it. Seemed like an episode written with an Emmy in mind. I prefer episodes like this where the characters are more than simply one-dimensional caricatures. Sue came off as more human. And we also got to see different sides to Kurt, Artie, Puck and even Tina (the fake stutterer). I've been a fan of the show for a while, but have had a problem with the writing. If tonight's episode signifies a different direction, then I'm all for it. They still need to work on both Rachel and Finn (they still seem just one-dimensional). Finn is dopey and Rachel is a diva, those 2 characters could be filled out better. I agree that the show has a major identity crisis, but am not sure that tonight's episode was a step in the right direction. For me, the show works best when it exists in a zany, heightened reality, like Arrested Development or 30 Rock, albeit with (much) less funny jokes. The big pathos-filled moments, Kurt's Father, Sue's Sister, feel incongruous with the world of the show, where teacher's plant pot in student's lockers, and people lie about pregnancies. That's not to say that I think the wackier plots, like the five million love triangles, are particularly interesting. The show's enjoyable enough, but I wish it would just get it's act together and find a consistent tone. Even though I like the musical Wicked, having a guy sing Defying Gravity is a nice change from the Idina Menzel-lite that we normally hear. BTW, if you check You tube, there is a version that is Kurt only (sans cracked note), Rachel only and a duet with both. I always end up in a better mood after an episode of Glee, so I really want this show to continue, and continue at a high level. I must like the cartoonish episodes of the show better, because I've found most of the other episodes to be wickedly funny, while this one was just sappy. Absolutely the strongest episode to date. I teared up at the scene between Sue and her sister, right when she reached for her hand. Glad they've given Sue some layers. Excellent direction overall tonight, too. The show finally felt like a real show tonight, and not just some wacky experiment. Everyone expressed genuine emotion instead of simply delivering punchlines much more clever than the characters themselves. Overall, I'd like to see the writers take care of the bad wife/fake pregnancy plotline asap and allow the Will/Emma relationship to grow more organically. These are two characters who acknowledged their feelings in episode two ("What are we doing, Will?") Alan, similar to your observation about Jeff and Brita on Community, any stifling of Will and Emma's development just feels like seeing the puppet strings. I really love this show. I get a kick out of the stories and scenes that are over the top and view the show as comedy/fantasy/musical mash-up. This episode was a little more serious-feeling so I didn't get the same outright joy that I usually do. Having said that, I was moved by the Sue story and the revelation about her big sister and really like the way they're handling (against expectations) the Kurt/Dad storyline. I watch about every third episode with my girlfriend. Nowhere near the target demo but do enjoy most of the music and I believe that Jane Lynch could find a way to make a recipe for quiche hilarious. All that said the GF was in tears during the down syndrome scene (probably rightfully so, Im just an emotionless robot)which I thought was great, and I like the way Mike O'Malley has been written. My biggest beef with the episode (aside from the poor acting, IMHO, from the students and will) was that I don't get why Rachel and Kurt couldn't have sung the song in the same way they showed on the show. I thought that worked great. I don't really know the ins and out of what I'm sure is a cutthroat activity so maybe there are tons of solos and less group singing but that seemed like an easy solution to me. If it weren't for the lady I would probably never watch again, but I certainly don't hate the show when I do watch. "Artie understands." "We didn't think you'd take it personally." "PREACH!" table and how proud Rachel was that she got her food down. Guys? Double-turns are easy. chair spinning and pumping her fist. Her hip hop class is really popular at my camp. No, wheelchair ramps aren't expensive or inspirational, they're required by law in a little thing called ADA. Finally, Puck is awesome, and has that rare talent where he can rock the fauxhawk without looking like a tool. I loved this episode...i really hope they stick with this tone and direction: less camp/wackiness and more character and heart, please! In the end, it was the way this episode explored the kids' differences, instead of just depicting them being tortured for them, that made it a huge step above the rest. Baylink is a huge fan of Wicked and of Kristin but I haven't seen it. The songs I've heard seem good. I liked the heartwarming stuff. And I really liked not seeing Jessalyn, coach guy or Emma. I want to like Will and even though his wife is an idiot, seeing him and Emma moon over each other is, for some reason I can't pin down, even more annoying than season 2 Grey's Anatomy Mer/Derek/Addison. At least someone there had a conscience. (I think it was Meredith). These two dance around their emotional affair and the writers expect us to like them? or do they expect us to just laugh at them. The lead, should, at least, be sympathetic. Campy is nice, but this was better. And Finn is an idiot who deserves Quinn if he can't see what is going on with Puck. Which is sad, cause I want to like him too. I did feel bad for faux-stutter girl, though. She really wasn't trying to hurt anyone. And she really did like Artie. I've been up to my ears in other people's fights for the past two days and haven't had the chance to even read the Monday night reviews. darn. Good lord, I don't think I've ever spent half the running time of a television show on the verge of tears. Between Artie, Kurt and his father, and Sue and her sister, I could barely keep it together. I am *such* a sap. For the first time, I was irritated that Rachel was automatically given the solo, and Will lost a point or two for that. But he gained them back, and then some, by forcing the kids to spend 3 hours a day in a wheelchair. I love this show whether it's broad, silly and unrealistic, or serious and sentimental. Three weeks without an episode was too long. RE: Mike O"Malley. I actually watched a few episodes of "Yes, Dear", and he was the funniest person on the show. (Graded on a curve, of course) He even makes Time-Warner commercials funny, because he has really good timing. But he does a great job as a tough guy who unconditionally loves his gay son, even while he's confused by his son's life. Their scenes together are one of the highlights of the show for me. PS: I don't know what the point was of Tina revealing that her stutter was fake, thus ruining any chance of romance for her and Artie, but it seemed unnecessary and completely out of left field. And it pissed me off. I don't think Tina was revealing that her stutter was fake, I thought she was showing that she was comfortable with Artie - often people with stutters only have them in public/nervous situations but don't have problems when they're relaxed. At times it's as broad and in-your-face and self-congratulatory as every other Ryan Murphy show that I eventually stop watching out of frustration, and at other times it can be relatively human-scale - and, to my mind, much more interesting. Indeed -- and I think another irritating thing about Ryan Murphy is that it often feels like the writers and producers are just randomly throwing stuff at the wall and seeing what sticks. If you're going for ultra high camp on steroids, it's essential to have a really solid foundation to work off, and like the hot mess that was Popular's last season, Glee too often feels like bad improv. I kind of feel like benk: Having set up its own cartoony, deliberately preposterous level of reality, the show can't just turn on a dime and say "but see, everybody has real feelings and Sue is human." That's doesn't add "depth"; it's just cheap playing to the gallery that undermines what they've already established (even though I wasn't thrilled with what they'd already established). If Sue were human, she couldn't have said everything she's been given to say in all the previous episodes. You can't have it both ways at the same time. As far as I can recall, Tina was definite that the stutter was something she deliberately faked. I felt completely vindicated last night, as I've been saying for weeks that the only "original" Glee Club member who hadn't had any real plot devoted to him was Artie. In fact, I didn't even know his name before last night. I just kept saying to my friends, "They've got to give a storyline to the guy in the wheelchair, stat." I've also been saying, "They have GOT to get rid of this fake pregnancy plotline--it is RIDICULOUS." I mean, seriously: how is she planning on handling the delivery? So it was a huge relief to have no Terry last night. The Sue Sylvester storyline--I'm a little unsure of. She's absolutely been a cartoon--albeit one that Jane Lynch has worn like a glove--and while it was lovely to see her with her sister (I completely teared up, I confess it), and it explained why she had taken the new Cheerio and installed the ramps on her own dime, it's still a little bit of a stretch to decipher how someone who can be so tender with her institutionalized big sister is so vicious to everyone else. Having set up its own cartoony, deliberately preposterous level of reality, the show can't just turn on a dime and say "but see, everybody has real feelings and Sue is human." That's doesn't add "depth"; it's just cheap playing to the gallery that undermines what they've already established (even though I wasn't thrilled with what they'd already established). But this was only the 9th episode of the show (it feels like it's been on longer because of the episode last spring), and the show's been fairly schizoid to date. Sometimes, it can take a new show this long - or even longer - to settle on an identity. And given that you and others admit to not being all that happy with some of the previous identities, wouldn't you rather the show try on one that actually works, even if it's a bit jarring compared to some of what we've already seen? If the show lasts for several years, and "Wheels" winds up being the template for what they do, then it's not going to feel as weird a shift in retrospect. As for Sue, I don't think this negates or undermines her previous behavior. Sue can still be an absolute monster with one sweet spot. In general, I prefer my comic antagonists to be recognizably human in some way; it's why (to reach back a few decades) I always preferred Charles Emerson Winchester III (who was a jerk, but an understandable one) on "MASH" to Frank Burns (who was just a punching bag). This episode proved beyond a doubt that Puck has better chemistry with both Quinn and Rachel than Finn does. The home ec/baking scene was probably the most romantic scene yet on the show. Who isn't rooting for Puck? I did wonder what these kids learn in school if Quinn can get away with saying she will keep pretending Finn is the baby daddy forever, despite the joke about it having a baby mohawk. Hasn't anyone heard of DNA testing? I also agree that it would have been easy to have Kurt and Rachel split the solos on "Defying Gravity." Maybe I don't understand the whole Glee Club system, but it does seem that incorporating more strong singers into your routine would be better than making it appear as if you have a great singer with a lot of back-ups. It's not the American Idol sectionals for solo performers, right? "No stupid fake pregnancy subplot (though it did have the slightly less stupid fake baby daddy subplot), nor any of Jessalyn Gilsig, period." U have it all right!!! Like if U read my mind I hate all those baby subplots so much. Love Leah Michelle her smile atone for all the baby bull. Something I neglected to mention last night: this episode was directed by Paris Barclay, who also directed this week's "Sons of Anarchy," making for one of the more schizo - but effective - back-to-back TV directing gigs I can remember. I'm with Maura, I do not understand why Mr. Schuester insists on feeding Rachel's diva tendencies. It is rapidly putting her in competition with Mrs. Schue for the least appealing character on the show. With a group of kids who clearly have chops, why make her the go-to person for every solo? It also only serves to undo any of the character advancement she gained in the Kristin Chenoweth episode. And I'm really disappointed that they wussed out with Kurt on that song, especially given how great Chris Colfer sounds on the studio version. And I love the depth they're giving Sue, because she's so right in her final confrontation with Mr. Schue and I can't believe I was actually rooting for her as she took him down a peg. It just shows what a great presence Jane Lynch has. She totally owns this character (and the show). I'm with Maura, I do not understand why Mr. Schuester insists on feeding Rachel's diva tendencies. It is rapidly putting her in competition with Mrs. Schue for the least appealing character on the show. With a group of kids who clearly have chops, why make her the go-to person for every solo? It also only serves to undo any of the character advancement she gained in the Kristin Chenoweth episode. Exactly, Jen. I'm not even sure why, but something about it really bothered me. Handing Rachel the solo felt like a step too far. Why not hold auditions as a matter of course? The episode was so good that I actually forgot about the fake pregnancy storyline. I know they have to resolve it eventually. I hope it happens soon. I couldn't help but wonder if Lea Michele was half-auditioning for Elphaba if there's a movie version of "Wicked." Odd, I thought this was easily the weakest episode to date. A couple of poignant moments (Sue and her sister especially), but the pace was slow and there wasn't much humor or weirdness or singing for that matter. On top of that, Artie's solo and "Proud Mary" were probably the two worst performances of the series. I loved it. Favorite episode and I'm glad Alan noticed it. Way to go for Glee for taking the Very Special Episode and managing to keep it pretty cool and not terribly preachy. Though I am still undecided on how I feel about Sue's sweet spot being put in there. On the other hand, upon rewatching I realized that Becky was GIGGLING a bit after Sue's chew-out-- she didn't mind it. That was a hint I hadn't noticed the first time. I was also happy to see Artie finally get a storyline, though I wish the episode had had a bit less "Quinn yells at Finn" in it and more Artie. That said, Puck about made that plot work. You root for him and Quinn, even if she's awful. Go figure. Kurt and his dad were the best plot of the night. Awwwww. I liked "Proud Mary." Awesome choreography to it too. I really do like the wheelchair dancing on this show. As for Artie and Tina, I think Artie went for Tina in some part because he also considered her "disabled" and was hurt that they didn't have that in common really. On the other hand, Tina telling him the truth about it was pretty big on her part. I hope they work this out soon. Did not miss the Shue love quadrangle in this episode at all. Question. We're all supposed to hate Rachel, right? They should just give Jessalyn Gilsig the Chuck Cunningham treatment and be done with her. No one likes the character; no one cares about Will's home life. What's to stop them? You're kidding! I can see how Proud Mary didn't work for you (I thought it was just ok) but Dancing with Myself was great! The guy who plays Artie is by far the best male singer on the show, and did a great job with that song (which was a very fun version in and of itself). Alan, in terms of finding a tone that works, I think it's important to note that Glee is more limited in terms what it can be than most other teen shows because of it's most notable and discussed element: the songs. Having musical numbers, whether it's the whole gang performing on stage, or Artie singing alone, plays a big role in terms of the world of the show. The reality of Glee has to be heightened in order for the musical numbers to not feel out of place. That's why the heartfelt stories don't really belong. In my opinion, the episode in which Kristen Chenowith guest-starred was the best in terms of having a real plot, that had a "moral," but wasn't at all sappy. Sue's sister does not feel in the same world as the performance of Proud Mary. For me, that's why the show feels so schizophrenic. Since Paris' roots--I'm talking way back, even before music videos--are in musical theater, this is pretty amazing. I agree with Benk, and in fact, had the very conversation at lunch today discussing why Arrested Development works and Glee does not. Glee doesn't know if it wants to be absurdist, intellect driven comedy like AD (where none of the characters are relatable or sympathetic which is why we love them a la Sue Sylvester) or sentimental comedy that manipulates the audience's emotions. At present its succeeding at neither -- but my thirteen year old daughter loves it. If the tone they've decided to shoot for going forward is "unbearably maudlin," count me out. The comedy to cringe-inducing musical number ratio was already near critical mass. It has been said that there are 3 basic questions to be asked when critiquing a work of art: 1) what is the artist trying to do? 2) is it a legitimate thing to try? 3) how well did the artist succeed at it? What we are seeing is not glee club but "show choir," some national championship performances of which can be seen on YouTube. In the real world, a school would prepare and exhaustively rehearse only a handful of numbers, so even that element of Glee that treats us to several new songs an episode is utterly false but utterly necessary for a TV series. Finally, Rachel. Murphy had met Lea Michele and developed Glee with her in mind for the central student role. She is presented as something of a force of nature, a 16-year old with the voice of a B'way musical star (which Lea had been in "Spring Awakening"), the brains and vocabulary of a Harvard undergraduate, the sexuality of a (still virgin) senior cheerleader (check out the Celibacy Club and auditorium seduction scenes in Ep. 2), the ambition and ego of a Streisand, and the social skills of a middle-schooler. While her diva side has been on frequent display, she has also been given several key scenes where she has been self-aware, insightful, supportive, and selfless. In "Wheels," for example, she devises a clever, slightly unethical plan to help Finn (on whom she has such a huge crush that she dumped Puck!) get a job to support Quinn so that the mommy-to-be and the (supposed) babydaddy can stay together. At this point, Rachel is the most developed and complex character in the show, along perhaps with Will. For me, the single, huge missing element is the presence of her "2 gay dads." The short, four-eyed Jew and the tall African-American might give Modern Family a run for its money, especially when these "Friends of Judy" stage-father Rachel. I want to address Benk on this basis, as I believe that while he correctly perceives what is happening on Glee, he enjoys it far less than he might if he deemed its inconsistent tone legitimate, as I do. The visual arts has its collages, assemblages, Rauschenberg combines. Drama has Shakespearean comedies that mix the sublime and ridiculous ("Much Ado," say) and Chekhov, who considered all his plays to be comedies ("The Seagull," with its suicide, anyone?). Film has its Bunuel, Godard, Lynch. There are an untold number of other examples one could cite. If life in general, and adolescence in particular, can often abruptly veer from one tone to another, why shouldn't a TV series go a little crazy in juxtaposing (mashup, if you will) all the weirdness and inconsistencies inherent in everyday events and thoughts. The craziness of the presentation is an artistic expression of the high school experience, just as high notes in a song express an emotion beyond the capability of the lyrics. Finally, Rachel. Murphy had met Lea Michele and developed Glee with her in mind for the central student role. She is presented as something of a force of nature, a 16-year old with the voice of a B'way musical star (which Lea had been in "Spring Awakening"), the brains and vocabulary of a Harvard undergraduate, the sexuality of a (still virgin) senior cheerleader (check out the Celibacy Club and auditorium seduction scenes in Ep. 2), the ambition and ego of a Streisand, and the social skills of a middle-schooler. While her diva side has been on frequent display, she has also been given several key scenes where she has been self-aware, insightful, supportive, and selfless. In "Wheels," for example, she devises a clever, slightly unethical plan to help Finn (on whom she has such a huge crush that she dumped Puck!) get a job to support Quinn so that the mommy-to-be and the (supposed) babydaddy can stay together. At this point, Rachel is the most developed and complex character in the show, along perhaps with Will. For me, the single, huge missing element is the presence of her "2 gay dads." The short, four-eyed Jew and the tall African-American might give "Modern Family" a run for its money, especially when these "Friends of Judy" stage-father Rachel. Another plot point that bugged me about this episode - the handicapable van. 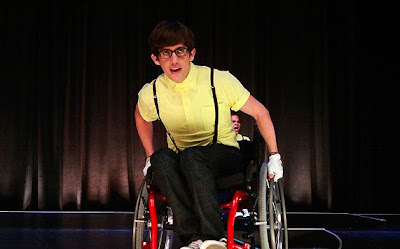 We learn that the rest of the glee club has been carrying Artie into the auditorium all this time because there is no ramp. So... what's the problem with lifting him into the current bus/van/transportation option? His dad is going up anyway so can carry the wheelchair in the trunk (or wherever he normally stashes it when Artie is in the family car.) Or... why not have the other kids take turns riding with Artie and his dad? I get that the idea is for the entire glee club to bond as a group on the trips, but if it's not financially possible, then you work around it and look for creative ways to help your group bond. But of course, we're talking about the man who has never once seen his pregnant wife naked nor touched her growing belly nor rolled over in the night and put an arm around her midsection. Jessalyn Gilsig's character is *written* to be hated, which is the major thing that bothers me about the show; she's 2D in a negative way. I like "Glee" a great deal--I end up grading shows on a curve if they're even halfway ambitious, and this one's hugely ambitious, original and, even though it's candy-colored, feels real about the emotional experience of being an outcast in high school. Glad Artie finally got a storyline. I've always interpreted art with authorial intent being relatively unimportant. I'm not really interested in what the artist intends to achieve compared to what actually is produced. Regardless, I agree there's nothing inherently wrong with creating a work with multiple tones. I don't think one can compare Glee, or any dramatic work for that matter, with a collage or visual art, if only for the reason that a collage is not experienced in real-time the way a play or television program is. While Shakespeare and Chekov produce works that have moments of lightheartedness contrasted with darker moments, it's never schizophrenic the way Glee does. To compare Glee with something more on it's level, a show like Desperate Housewives, another hour-long dramady, has wacky moments while at the same time being extremely heartfelt. For comedies, Arrested Development had somewhat of a heart with George-Michael. 30 Rock has different layer of reality, with Tina Fey being much more grounded than Tracy Morgan. Dramas like Mad Men and Lost certainly have comedic moments that contrast with the shows more serious plots. The point I am making is that it is possible for tv shows to successfully navigate shifts of tone. In terms of intent, I doubt Ryan Murphy wanted to create a show that felt disorienting to watch to mimic the experience of being an adolescent. At the same time, there's no way of knowing, so there's little point in discussing Murphy's intentions. All I can say is that whatever he's doing is not working. I leave the show feeling like I'm watching scenes that belong in different shows. As a fan of musical theater, I want Glee to work. When it does, I really enjoy it, but I usually end up feeling frustrated with the show. I don't know or care about what Murphy has in his own mind. I have never seen a second of any of his other shows. The only other TV comedies I currently watch are HIMYM, NBC Thursday 8-10, Arrested Dev (again) on IFC. I hate high-school based shows unless Connie Britton is in charge or Claire Danes is in love. So how did I get to to where I am with Glee? It began with passive enjoyment. Then I wondered why it works, especially since all sorts of different styles are banging up against each other. To give it purpose and legitimacy in my own mind, I created a rationale out of whole cloth (as Clement Greenberg did for Pollock). It is against my invented basis that I then critique the quality of succeeding episodes. It's an iterative process, and the analytic element can affect my enjoyment. Of course, when too many individual scenes, taken by themselves, don't work as well as they should (and they often don't in Glee), all bets are off.